Mantra Crown Towers boasts a fantastic location in the centre of Surfers Paradise. A wide variety of shops, restaurants, cafes, bars and entertainment are all just a short stroll away from this Gold Coast accommodation. The popular Cavill Avenue and the golden sandy beach are also a short walk from this Gold Coast resort. This Gold Coast accommodation offers guests a unique holiday experience, with a choice of 1, 2 and 3 bedroom apartments. Each apartment features a spacious living area, gourmet kitchen and the services and facilities you would expect from a world class apartment resort. 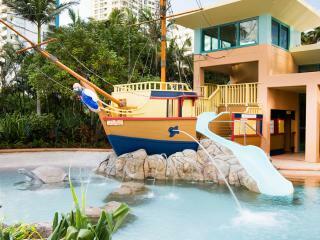 Outside is a tropical oasis with lagoon pool, island, sandy beach and pirate ship that the kids will just love. Mantra Crown Towers also has a heated indoor pool, spa, sauna, steam room, and gymnasium. 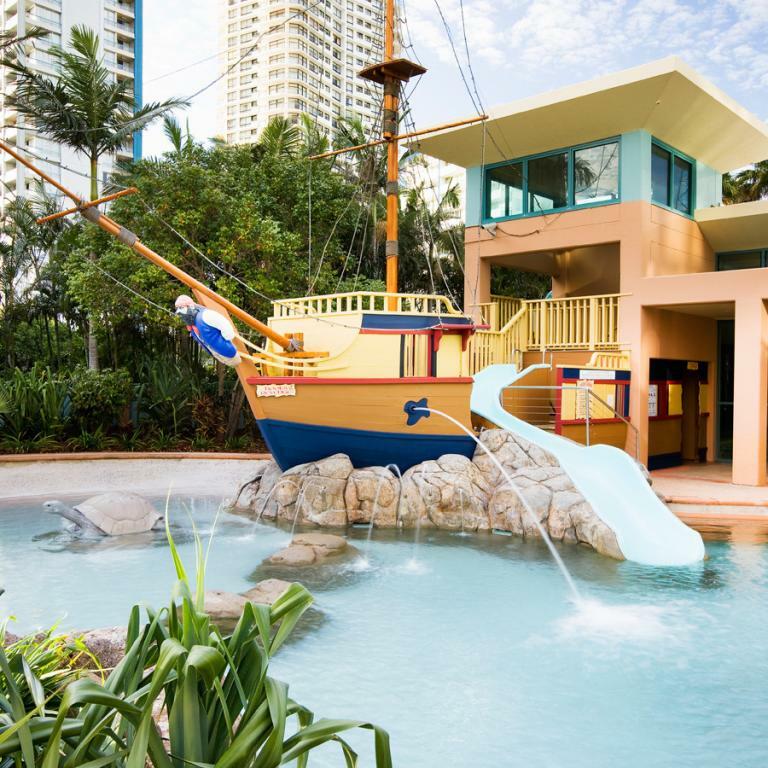 This is the ultimate resort to base yourself on your next Gold Coast holiday, as you are only minutes away from the action of Surfers Paradise and the excitement of Australia's Theme Parks. Mantra Crown Towers offers a range of 1, 2 and 3 bedroom fully self-contained apartments. 2 Bedroom Apartment: Bedding is 1 Queen Bed + 2 Single Beds. Features 2 bathrooms. Maximum room capacity is 6 Adults & Children. 2 Bedroom Ocean Apartment: Bedding is 1 Queen Bed + 2 Single Beds. Maximum room capacity is 6 Adults & Children. 3 Bedroom Apartment: Bedding is 1 Queen Bed + 1 Double Bed + 2 Single Beds. Apartment has 2 bathrooms. Maximum room capacity is 8 Adults & Children. Flux Cafe, Restaurant & Bar: Enjoy a meal in a casual, relaxed dining atmosphere. With a constant change of modern Australian food. Open from 7.00am daily for breakfast, lunch and dinner. Chiangmai Thai: Located in the lobby of Mantra Crown Towers, opposite the lagoon pool, the award-winning Chang Mai Thai restaurant provides authentic Thai cuisine, with strong Thai influences such as wooden elephant chairs and decorative motifs scattered throughout the restaurant adding to the Thai experience. Open daily for dinner. Calmer Therapies Day Spa: Why not add an extra touch to your Gold Coast holiday and spoil yourself at this fantast Day Spa. Enjoy a range of soothing body and face treatments including massages, scrubs and facials.